Tasby took a while to reach the majors, which he viewed as a function of racism. “Tasby. . . felt he was unjustly left to rot in the minors. ‘Baseball wasn’t nearly as good to me as I was to baseball.’”2 Nonetheless, he persevered and played in 583 big-league games over six seasons. Tasby was born in Shreveport, Louisiana, on January 8, 1933. The 1940 United States census shows him as Willie Lee Tasby, the fourth of seven children born to John and Mary Tasby. The player questionnaire he completed for the National Baseball Hall of Fame states “NMN” – no middle name – but he also wrote that he was “Willie Jr.” John was a yardman doing private work.3 The family evidently moved to California at a later time, perhaps one of the many families who relocated to work on the West Coast during the Second World War. Willie attended the Prescott Elementary School prior to McClymonds. He was right-handed, stood 5-feet-11, and is listed at 170 pounds. Before the 1950 season, he was signed by Tony Robello for the St. Louis Browns when he was 17 years old.4 He stayed in the Browns organization for a full decade, through the franchise shift to Baltimore, and debuted for the Baltimore Orioles in 1958. We have only skimpy stats for his first two seasons in Class C: seven Northern League games for the Fargo-Moorhead Twins in 1950 and four in the Southwest International League for the 1951 Phoenix Senators. Tasby married Jacqueline Lacy of Alameda, California, in December 1950. However, his player questionnaire says he married Cathrine Hart on December 23, 1949 – at which time he was 16. He played winter ball in Puerto Rico in 1954/55 and suffered a very serious ankle injury, fracturing it in the last game of the season. It was not until mid-July that he was able to resume play, joining the AA San Antonio Missions.7 He hit .279 with 19 homers in 48 games. Tasby began the 1957 season with the Vancouver Mounties and played very well (he was 6-for-13) in the three regular-season games in which he appeared, but on April 21 he jumped the club and was reportedly heading home to Oakland. Mounties manager Charlie Metro said, “Willie has all the ability in the world, but he’s irresponsible. He may come back to us just as quickly as he left, but we have other plans for our outfield, anyway.”10 The Orioles found a place for him with the Knoxville Smokies in the Class-A South Atlantic League. He appeared in 132 games, homered 20 times, drove in 86 runs, and batted .272. He also stole 20 bases. Tasby played the 1958 season for the Louisville Colonels, Baltimore’s Triple-A team. He was named to the league All-Star team, and was voted Rookie of the Year in the American Association. His 174 base hits led the league. He hit for a .322 batting average (second in the league), and his 22 homers helped him drive in 95 runs for a Colonels team that finished in last place. On September 6 he was called up to the Baltimore Orioles. His major-league debut came in Kansas City on September 9. The Orioles were losing, 7-2, and so at the game’s midpoint, manager Paul Richards had Tasby (a very good fielder, with a career .980 fielding percentage in 1,183 chances) go in to spell Gene Woodling in right field. He was second up in the top of the sixth and singled to left field, putting two men on base, then scoried on a home run to help bring the Orioles to being just down by two, 7-5. His next time up, he was hit by a pitch. He got up one more time and struck out leading off the ninth. He got a start the next day and collected both his first homer and RBI, off Bob Grim. It was the only homer and only run batted in that he had in his first season. Though he played in 18 games; his year-end batting average was .200. On September 20, he’d played center field through six, then shifted to right, and helped preserve Hoyt Wilhelm’s 1-0 no-hitter over the Yankees. It was the first no-hitter in modern-day Orioles history. He played winter ball for Havana in the winter of 1958/59 and was one of many American players in Cuba at the time of the Cuban Revolution at the beginning of January. Like the others, he had to wait until the players could be brought back to the United States. As it happened, the Orioles had finished sixth in 1958 and did so again in 1959. Tasby started off with an eight-game hitting streak and hit safely in 13 of his first 14 games, but cooled off as the season wore on. From hitting .304 at the end of May, he was down to .250 at season’s end (with a .303 on-base percentage, though he struck out more than twice as often as he walked). He typically batted leadoff and scored 69 runs; he drove in 48. He homered 13 times. He became a regular for the Red Sox and got into 105 games, usually playing in center field alongside Ted Williams in left. Lou Clinton played most of the games in right field. Over that stretch, Tasby hit .281 (.371 OBP), scoring 68 runs and driving in 37. He had only hit seven homers, but that still ranked him fifth on the Red Sox. Even before mid-September, he was signed again for 1961. Tasby played a full season with the Senators, appearing in 141 games and leading the team in runs batted in with 63. He homered 17 times, bettered only by Gene Green’s 18. He had been hitting .300 into July, but tailed off progressively as the season wore on. In the end, he hit for a .251 batting average with a .330 OPS. Washington ended the year tied for last place in the league. There had been criticism in mid- to late September that all three of their top sluggers – Tasby, Green, and Dale Long – had not been sufficiently hustling (and all three were benched at one point, all at the same time.) Tasby said he was trying as hard as ever, but was simply in a slump.24 When the Senators picked up Jimmy Piersall at the beginning of October, it looked like there was less room for Tasby and that he and Green might be available in trade. Tasby played in 11 games for the 1962 Senators (batting .206 without an RBI) before he was traded on May 3 to the Cleveland Indians for two left-handed pitchers, Steve Hamilton and Don Rudolph. He played in 75 games for the Indians, one of three backup outfielders and the one who got the least amount of work. He hit .241 with four homers and 17 RBIs. His last year in the majors was 1963. He was the team’s fifth outfielder, appeared in 52 games and hit .224. He homered four times but drove in only five runs. He’d been up and down to the minors, optioned to Jacksonville in early May and recalled in mid-June. He hadn’t hit much better in Triple A, batting .229 in 35 games. At the end of the season, Cleveland assigned his contract outright to Jacksonville. His full 1964 season was spent in the Pacific Coast League playing for the Portland Beavers, where he had a successful .308 average. In 1965, he played his final year in professional baseball with Monterrey and Reynosa in the Mexican League. As of 2016, Tasby still lived in Plant City, Florida (about 25 miles east of Tampa). Information about him and his life after baseball is very scanty, but he did make a notable contribution to Bruce Adelson’s book about the integration of minor-league baseball in the American South, Brushing Back Jim Crow. This biography was reviewed by Norman Macht and Rory Costello. It was fact-checked by David Kritzler. In order to bring the story up to date, numerous attempts were made by telephone and mail over the course of a couple of months in 2017 but they have proved fruitless. Any additional information would be very welcome. In addition to the sources noted in this biography, the author also accessed Tasby's player questionnaire from the National Baseball Hall of Fame, the Encyclopedia of Minor League Baseball, Retrosheet.org, Baseball-Reference.com, Rod Nelson of SABR's Scouts Committee, and the SABR Minor Leagues Database, accessed online at Baseball-Reference.com. 2 Adam Sobsey, “Minority Leagues,” Indy Week, April 2007. This was a review of the 2007 edition of Bruce Adelson’s book Brushing Back Jim Crow, reissued to commemorate the 60th anniversary of Jackie Robinson’s breaking of the color barrier. The quote may be found on page 106 of Adelson’s book, originally published by University Press of Virginia in 1999. 3 It is possible that this is not the correct Tasby. Family details have proven very difficult to determine. 4 Thanks to Rod Nelson of SABR’s Scouts Committee for this information. 5 Adelson, Brushing Back Jim Crow, 102. 7 “Tasby Joins San Antonio,” Pittsburgh Courier, July 23, 1955: 22. “Oilers Hit Real Gusher,” The Sporting News, June 29, 1955, 36. 8 “Orioles Farm System Has 21 Tan Players,” Chicago Defender, February 23, 1957: 22. 9 Adelson, Brushing Back Jim Crow (page number unavailable from Internet view). 10 Tasby had reportedly been upset over being benched in a game. Associated Press, “Tasby Jumps Club After Benching,” Dallas Morning News, April 22, 1957: 21. 11 Paul Richards, Richards Says Oriole Team To Be Stronger,” Huntsville (Alabama) Times, February 10, 1959: 10. Tasby was not the MVP; that honor went to Wayne Terwilliger. 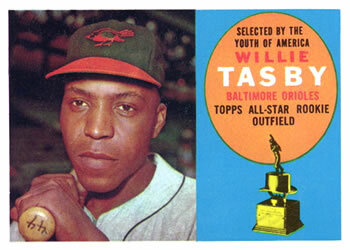 12 Dan Haller, “Willie Tasby Holds Key To Chances of Orioles,” Washington Post, April 5, 1959: K12. 13 Associated Press, “Fielder Plays Cautiously in Lightning Scare,” Sacramento Bee, July 21, 1959: 31. 14 D. Leo Monahan, “Tasby Provides Solid Solution to Red Sox CF Woes,” Boston Daily Record, June 18, 1960: 23. 15 Bob Addie, “Tasby Tried Too Hard to Live Up to His Billing,” Washington Post, March 3, 1961: C1. 16 Joe Cashman, “Tasby’s Power Made Red Sox Swap Stephens,” Boston Daily Record, June 11, 1960: 35. 17 “Tasby Is Newest Member of Red Sox,” Pittsburgh Courier, June 18, 1960: 24. 18 Ralph Wheeler, “Red Sox Split with Chisox,” Boston Herald, June 12, 1960: 190. 19 Larry Claflin, “Stengel Moans As Sox Sweep,” Boston American, July 11, 1960: 39. 20 Hy Hurwitz, “Tasby, Fornieles Were There, Too,” Boston Globe, July 26, 1960: 31. 21 Tom Monahan, “DiMaggio Credits Tasby With Improving Bosox,” Boston Traveler, August 20, 1960: 6. 22 Ed Rumill, “Mike Higgins Establishes Willie Tasby in Lead-Off Batting Position,” Christian Science Monitor, June 25, 1960: 14. 23 “Sox Lose Casale, Tasby, Sturdivant,” Boston Daily Record, December 15, 1960: 36. 24 See, for instance, UPI, “Senator Owner Accuses Long, Tasby, Green of ‘Indifference’,” Los Angeles Times, August 31, 1961: C1. A year later, Shirley Povich wrote a column about the Senators owner entitled “Quesada Leads League in Ill-Timed Remarks,” Washington Post, August 14, 1962: A14. 25 Dave Brady, “Tasby Content But Says Move By Nats Would Solve Housing,” Washington Post, February 16, 1962: D1. 26 UPI, “Tasby Charged with Non-Support,” Washington Post, July 21, 1962: C8. 27 “Watson and Rice Power the Red Sox Past the Orioles, 10-2,” Evening Star (Washington DC), September 16, 1979: 16.